Rice flour is an essential item for any Indian Festivals especially Diwali, Ganesh Chaturthi; the sweet and savoury snacks are mainly made out of rice flour such as Modak, Kozhukattai, Seedai, Murukku ..etc. 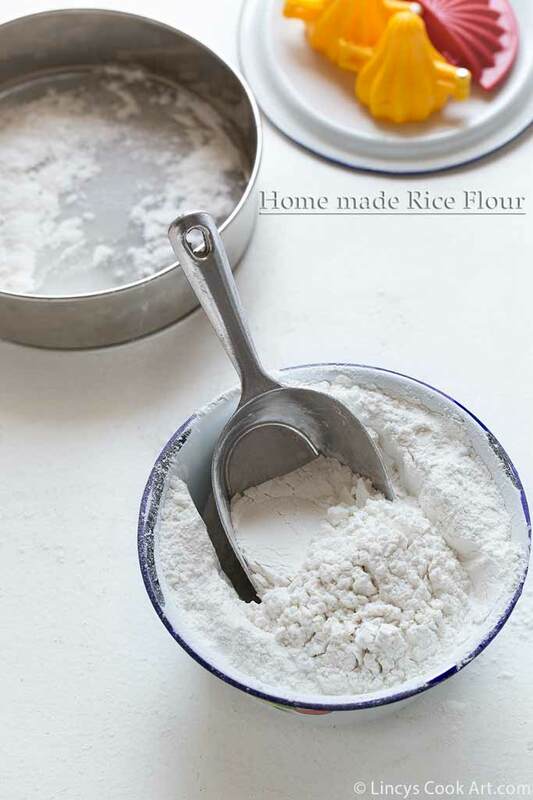 Home made rice flour adds the dishes more taste and flavour as it is prepared fresh. Other than that some of the South Indian breakfast items are also prepared using rice flour such as Idiyappam, Appam, Pathiri, Puttu (refer notes).It is an essential ingredient for all South Indian home. Nowadays it is available in ready made form too but the taste could not be compared with the freshly roasted rice flour. Rinse the rice three times and soak in water for 1 hour. Drain the water and spread evenly on a soft towel and allow to dry on kitchen counter or even under sun for little time for minimum 30 minutes to 1 hour. Now the rice would be slightly moist, transfer the rice into a big blender jar and powder small lots(approximately one cup) at a time. Do not over load the mixer jar then the jar get heated up and stop finally. Spread a news paper or keep a big tray and transfer the powdered rice a big scoop on a strainer fitted with fine sieve get the fine rice powder. Sieve until the rice rava settles on top and the fine powder separates on a paper. Repeat till you finish the whole lot. Dry roast the fine rice flour in a heavy bottom vessel in low flame to medium flame with constant stirring. The rice starts to get a sand like texture and sound. While roasting and the steam starts to arise from the flour. Spread the roasted flour on a paper to big tray and allow to cool. Transfer the flour on a air tight container. Note: Same way do for puttu flour but strain the flour with coarse sieve fitter on a strainer. Hey quite long time no post frm u.. Eagerly waiting for u to be back. I love ur recipes so much tat I visit ur website everyday.